Cousin Alexander “Deacon” Robb was a famous local character in nineteenth century Aberdeen, a Deacon of the Tailors in the Incorporated Trades and a published poet - with perhaps more in common with William McGonagall than Robert Burns. His father, also Alexander Robb, married Isabel Murray, Andrew’s sister, on 14 July 1781 in Banchory Devenick. His book of poems: Poems and Songs, chiefly in the Scottish dialect, and on subjects of local interest, with this portrait and his own introduction, is available as a free ebook on GoogleBooks. The text around the bottom of the portrait reads: “from Life on stone by L. Ghémar - Keith & Gibb Lithrs. Aberdeen”. Louis- Joseph Ghémar was a Belgian lithographer who worked with the firm of Keith & Gibb in Aberdeen in the autumn of 1851, and seems to have produced lithographs of quite a few of Aberdeen's worthies. He was an innovator in the field of lithography with an international reputation, and also later as a photographer. ALEXANDER ROBB Few men, with the same limited lyrical faculty, have succeeded so well in amusing a considerable section of their fellow citizens by their rhymed effusions, as Alexander Robb, tailor, and deacon of the Tailor Corporation. He was born in 1781, and for well nigh half a century was one of the leading merchant tailors of Aberdeen … in connection with local politics (the great hobby of his life) his ready muse and willing pen were ever on the move, framing some lilt to be sung at the annual Trades Dinner, or through the columns of the local press, harassing his opponents with the sarcasm and satire that seemed native to his character. Walker, William The bards of Bon-Accord 1375-1860. Aberdeen, J & JP Edmond & Spark 1887 Alexander Robb was baptised on the 13th April 1782 in Aberdeen. As his parents had only been married since the previous July I suspect he was actually born in 1782, as I find it hard to imagine his “severe and stern” father pre-empting his marriage vows. Alexander Robb Schoolmaster in Footdee & Isabel Murray his wife had a son born named Alexander. Baptized by the Revd. Alexr. Fullerton, Minister of Footdee, in presence of John Murray, Farmer in Banchory & George Steven Farmer at Roberslaw. [Rubislaw] Alexander was followed by Margaret (1783), Isabel (1785), Elizabeth (1787) and Christian (1789). They were all baptised in the Kirk of St Nicholas, Aberdeen, and the witnesses include: John Murray, twice, second time as tenant at the Mill of Banchory; George Steven, twice; Alexander Murray, carpenter in Footdee, twice; John Croll, tailor in Footdee, twice; John Robb, overseer of the fishing at Don; Alexander Marr, shipbuilder in Futtie (Footdee). The Rev. Alexander Fullerton baptised all of their children except their daughter Christian, as he had died on the 13th September 1787 “in his 51st year at Futtie”. John Murray must be Isabel’s father, as his address matches the baptisms of his own, later, children. John Robb, while probably a relation of Alexander’s, was married to another Isabel Murray, who was the aunt of Alexander’s wife Isabel. John Croll is a potential family member, as an Elspeth Murray married a John Croll in Banchory Devenick in 1739. I imagine that Alexander Murray is also a family member; Isabel did have a brother Alexander born in 1772, so too young to be a witness, and she also had an uncle Alexander born in 1720, the much older brother of John Robb’s wife. The Murrays married three times at least into the Robb family in the 1700s, and it’s getting to be quite complicated sorting them all out, especially with the generational overlap of oldest children having their own families, while their own siblings are still being born! Alexander Robb senior and the Rev. Alexander Fullerton both appear in the book The goodwife at home: Footdee in the 18th century. This account was written by Mrs Ann Allardyce, née Blair, who had been born at Eyemouth in 1777. She moved with her family as a child to Aberdeen, and resided at Footdee with her parents, her father being an officer in the Coastguard. Mr Blair died in 1801, and soon after, Ann was married to the Rev. Alexander Allardyce, minister of Forgue. Ann would have been only a few years older than the young Alexander and his siblings, so her descriptions of the minister and the schoolmaster, would have been from personal experience. "Their religious knowledge was very limited. Mr. Fullerton the minister was a good quiet man, but he wanted energy for the radical improvement and reformation of such people. They had public worship on the Sundays, and "examines" occasionally in "the chamber," but the effects were not very manifest, except on a few really well disposed and sincere persons. One circumstance was rather against them, viz., that the Sacrament was never dispensed in Footdee; there was preaching on the appointed days, and tokens were given as in other places, but on the Sunday forenoon there was no service and the people were obliged to shift for themselves by going to any of the churches in Aberdeen where they could find accommodation. The means of education were confined to those whose parents could afford to pay for them at the Parish School. It was kept at that time by a Mr. Robb, a man sufficiently "severe and stern to view," with a cocked hat and long skirted coat. He taught reading by the usual routine of going through the Shorter Catechism, Proverbs, and Bible; he also gave instruction in writing and arithmetic, but his pupils seldom remained so long as to make any proficiency; nothing was explained to them, and I believe no one would have presumed to ask him a question. He was on the whole a diligent teacher, attending to his school and coming to give me lessons two hours a day in the same dry and unvarying manner." [The goodwife at home: Footdee in the 18th century ; song: Fair in Kinrara / by Mrs Allardyce. Publisher: Aberdeen : William Smith, 1918. Originally published, 1872] The Robbs moved away from Footdee to Printfield and had two more children, Robert (1792) and Jean (1798). On Jean’s baptism it is confirmed that Alexander has a new job, Barrack master. Printfield is an elusive place, its memory lingers on in one or two street names in the northwest of Aberdeen, but it was associated with the large cotton works built at Woodside, and was an area alongside the canal. The only map I’ve found that shows it is in the Great Reform Act Plans and Reports,1832, online at the National Library of Scotland. The career change for Alexander is useful to know as it makes a credible step between being a schoolmaster and the tide-waiter he was when his daughter Margaret married Robert Gray in 1816, and excise officer on the inscription on his grave in 1829. Alexander and Isabel were both buried in Banchory Devenick, and appear to be the only members of the Murray family to have left a lasting memorial in the kirkyard: Alexander Robb late of the Excise Office Aberdeen died on the 12th February 1829 at the age of 83; his wife Isabel Murray died on the 12th February 1826 aged 77. Buried with them is their son Alexander, tailor in Aberdeen, who died on the 28th December 1859, aged 78. Alexander must have started working as a tailor out with the burgh of Aberdeen for when he petitioned to join the Tailors’ Trade in 1821 - and presumably move his business into the city - not only was he well into middle-age at 39, but he is also described as an “extranear”. On the 24th September 1821 “Alexander Robb presented a petition with a Remit. Whereupon his Essay was appointed to be a Suit of men's cloaths, which he is ordained to make with his own hands within six weeks from this date under the penalty of forty pounds scots to be paid by him to the Boxmaster for behoof of the poor of the trade”. Just over two weeks later on the 11th October “Alexander Robb presented his essay, which his essay-masters declared he had wrought with his own hands ; and the same being inspected by the trade was found sufficient, and he was declared qualified to exercise the trade. Whereupon he paid the usual dues as an extranear above thirty and under forty years of age, was admitted freeman and took the oath to the trade”. The Scottish Post Office Directories place Alexander Robb in Windmillbrae during the 1820s, after 1832 his address is Crown Court, Union Street. He was elected Deacon of the Tailors in 1834, and the PO Directory for 1835-36 reflects this, and names Eric Finlason as Boxmaster; Eric was Deacon the following year. 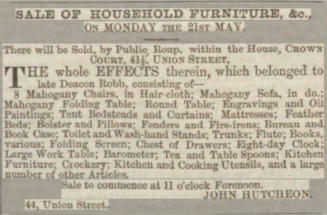 In 1836/37 they made a joint appeal to the House of Lords in the case of the Tailors of Aberdeen v. Coutts; which case the Caledonian Mercury (17 April 1837) considered to be entirely of a feudal nature, and devoid of public interest! Though modern opinion differs. Although Alexander was 20 years older than Eric Finlason (who would later in South Australia marry Alexander’s cousin, Margaret Murray) they were contemporaries in the Tailor Trade and both went on to hold important positions in the Incorporated Trades of Aberdeen, Eric being at one time Master of Hospital, and Alexander Treasurer of the Trades' School. Only Alexander, Margaret and Christian, out of Alexander and Isabel’s children, seem to make it into the early censuses. In 1841 Alexander is living in Union Street, aged 55, he is a Tailor. Living with him is his sister Christian, age 50, a female servant, and his sister Margaret and her husband Robert Gray, who, aged 60, is a Post Office Clerk. Margaret Robb had married Robert Gray on the 20th July 1816: 20 July 1816 Robt. Gray & Margaret Robb By the Revd. Mr. John Murray Minister of Trinity Chapel of Ease in Aberdeen were Lawfully Marriad [sic] in Said Chapel after due Proclamation of Banns Robert Gray Wright in Aberdeen & Margaret Robb there Daughter of Alexr. Robb Tide Waiter in Old Machar Parish in Witness the said Robb: & Alexr. Robson Clerk in Aberdeen. In 1851 Alexander and his sister Christian are living in Crown Court: still a tailor, he is now 68, and employing 3 men and boys; Christian at 62 has been promoted to housekeeper. The Grays are living in Union Terrace; Margaret died on the 6th January 1855, and her entry in the death register records her burial at Banchory Devenick. Robert died on the 30th June 1869 aged 93; by this time place of burial is no longered entered in the register, but I hope he was buried with his wife, near her parents and brother. Alexander’s name appears on the Roll of the Tailors’ Trade for the 20th October 1854 as a superannuated member as of that month; his name appears again in 1859 recording his final annuity payment. Christian appears in the 1861 census, aged 74 and unmarried, a former servant, living on her own at 31 George Street; she died from “infirmities of age” on the 21st April 1872, as Christina Robb, in the Aberdeen Poor House. Her age is given as 85, and she is said to be a Domestic servant; her death was registered by Mrs Dalglish, Governor. Poor Christian, it seems a very sad end for the sister of Deacon Robb. I presume they continued to live together until his death, when, with the entire contents of their house being sold, she had to set up on her own. Did he make any provision for her after his death I wonder? DEACON ROBB. Another familiar face is gone from among us. Deacon Robb died on Wednesday evening, at the advanced age of seventy-eight. There are few of our readers above boyhood who will not remember the well-known figure of the Deacon - while with a very large number of our more elderly citizens, he was a personal acquaintance, and an acquaintance whose stories of Aberdeen, half a century ago, and anecdotes of its leading men, have made many an evening pass pleasantly. The Deacon was "a soldier in his youth," having been a member of the once famous local body, "Finlayson's Volunteer Corps*," amongst whom he held the post of fugleman. For a long period of time, he was Clerk in St. Andrew's Chapel, from the members of which congregation he received a testimonial in appreciation of his services some years ago. He also filled the honourable office of Deacon of the Tailors in the Incorporated Trades - a body with whom he was otherwise closely associated, and who have ever entertained a warm feeling towards him. He was their Poet-Laureate, and it was a treat of no common order to hear the Deacon, in his glee, singing some [of] his own songs, such as "The Laddies at the Squeel." For half a century, too, the Deacon has been connected with the Banchory-Devenick Farmers' Society - a charitable body, whose proceedings he took an active interest in, never being absent from one of their meetings during the long period of his membership. Half a dozen years ago or so, the Deacon published a volume of poems, which had a large local circulation, and amongst his other literary efforts may be mentioned "a sermon" which he delivered to the Banchory Society, on the occasion of its being fifty years in existence. The Deacon, who has been ailing for several months, had a warm heart, possessed a fund of kindly humour, was highly honourable in his dealings, and enjoyed the respect of all who knew him. Aberdeen Press and Journal 4 January 1860 [*This should read Finlason’s Volunteer Corps, who were also known as the Loyal Aberdeen Volunteers or Finlason’s Fencibles, in existence from 1803-1808] The Aberdeen newspapers at the end of the 19th century carried several columns looking back at the town’s history and Deacon Robb’s time as a Clerk in St Andrew’s Chapel, from 1840 to 1851, is fondly recalled in one of the East Neuk Chronicles. Deacon Robb, the precentor, was a great favourite with his choir boys. Living as he did in Crown Court, close beside the day school, we saw him daily, and were always getting from him a word of encouragement. (Aberdeen Press and Journal 22 July 1896) While another from ten years later paints a more vivid portrait: He was a bluff-mannered man, and of almost Herculean proportions. Outspoken to a degree … on one occasion he criticised a sermon preached by his Bishop - Skinner - in no very complimentary terms. The Bishop is later recorded as saying that “he called it horse dung”. He was a member of James Davie’s choir who sang at the 1834 festival, and was considered a “useful and skilful vocalist. In a complicated passage those who sat next to him found him in the highest degree useful”. In another of James Davie’s concerts when performing the Laughing Chorus from Weber's Der Freischütz: the Deacon’s geniality and humour over-powered all rule and authority. Entering into the spirit of the chorus con amore he simply revelled in it - so outrageously too, that the staid, musical “Ha, ha’s” tried to run in harness, so to speak, “jumped the traces” and broke entirely away from the control of the conductor. In this “awkward dilemma”, the chorus were not slow to “follow the lead”, and the audience by this time also joining in, the music ended in a riotous torrent of laughter. Aberdeen Press and Journal 31 July 1906 The final words must be Alexander’s own as recorded in the book Merchant and Craft Guilds : a History of the Aberdeen Incorporated Trades, written by Ebenezer Bain and published in 1887. 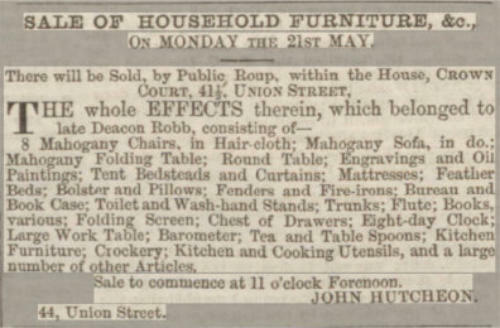 The Trades men of Aberdeen had to leave their old Trinity Hall in the mid-1840s when the coming of the railway necessitated its, and neighbouring properties’ demolition. The new Trinity Hall opened in 1847. Deacon Alexander Robb, a local poet with no mean talent for versification, sang the following lines at one of the last convivial gatherings held in the old hall, to the tune of "Happy are we a' thegither ":- But whare's the use o' waefu' skirlin', Lat us a' be happy yet, Altho' rail trains will soon be dirlin' O'er the spot whare now we sit. O, never lat us be down-hearted, "Let us drive dull care awa," Nor think our glory is departed Whan we leave our ancient ha'. Anither ha' will soon be finished Whare the sang o' joy shall rise, Our comforts a' be undiminished A Corporation never dies. Then why su'd we be now unhappy, Sorrow disna' set's ava; Push about the enlivenin' drappie Soon we'll get anither ha'. 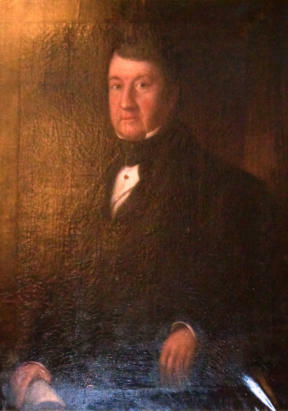 This portrait of Alexander Robb was painted by William Niddrie and it was hanging in the Trades Hall by 1850. By the end of the 19th century William Niddrie (1798-1873) was best known as “an itinerant portrait painter” who had been a pupil of James Giles F.S.A., and who gave his first lessons in portrait painting to Sir George Reid P.R.S.A. William was a native of Edinburgh, but was in Aberdeen by 1830 whe he married his first wife, Jane Murray. His occupation at the time, and also at the time of her death in 1842, was Thread Lapper. By 1851 with his second wife, Jane Connon, he describes himself as a Portrait painter. He was well- known in Aberdeen for his portraits of the “Trades’ worthies” and of others such as “poet- citizen, Mr Cadenhead”. 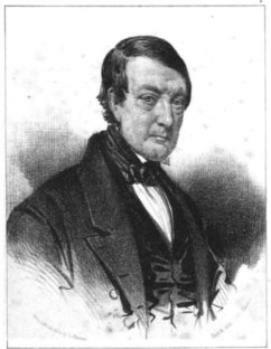 He was remembered by Sir George Reid as “a man of real instinct and enthusiasm for art, whom poverty and untoward circumstances, had prevented from attaining mastery.” These later accounts say that William ended his days working as a porter in the Aberdeen Savings Bank, and while the 1861 census, and the directories do find him there working as a messenger, from 1868 to his death in 1873 he is once again describing himself as an Artist.